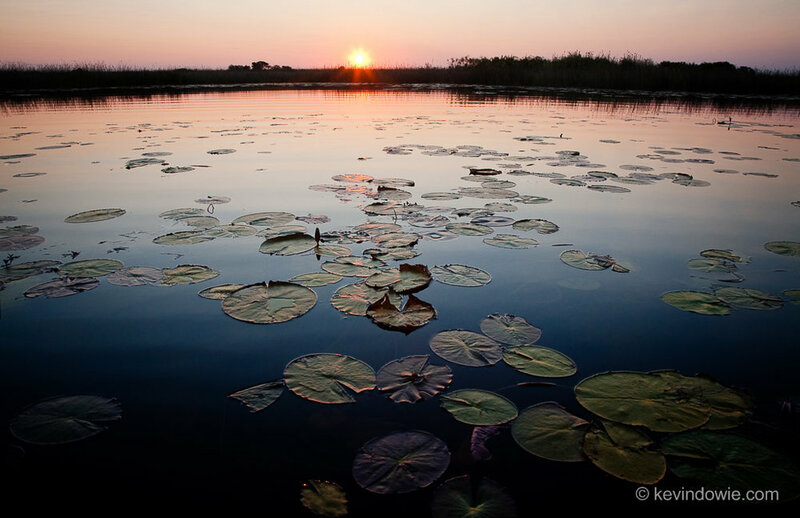 Sunset over the Okavango Delta in Botswana and I was in a small boat as we made our way back towards camp, when we paused briefly where the channel broadened to a large pool. The sky was largely cloudless and as a result the sunset itself was nothing inspiring, however the pool was home to many lily pads which looked interesting and so I decided to make those the key to the image. Utilizing a low viewpoint, I placed my camera as low to the water as I could get it and allowed the pond and lilies to fill the frame. Given that the image would include everything from the horizon and sky to right in front of the lens, I needed as much depth of field as possible. This is where a wide angle lens is so valuable. The perspective of the lens allows for great apparent depth of focus, particularly when stopped down to a small aperture. With a combination of small aperture and falling light, the shutter speed was down to 1/40 second. A steady hand and image stabilization technology helps! Canon 5D with 24-105mm zoom at 24mm, F13.0, shutter speed 1/40 second at ISO 400.